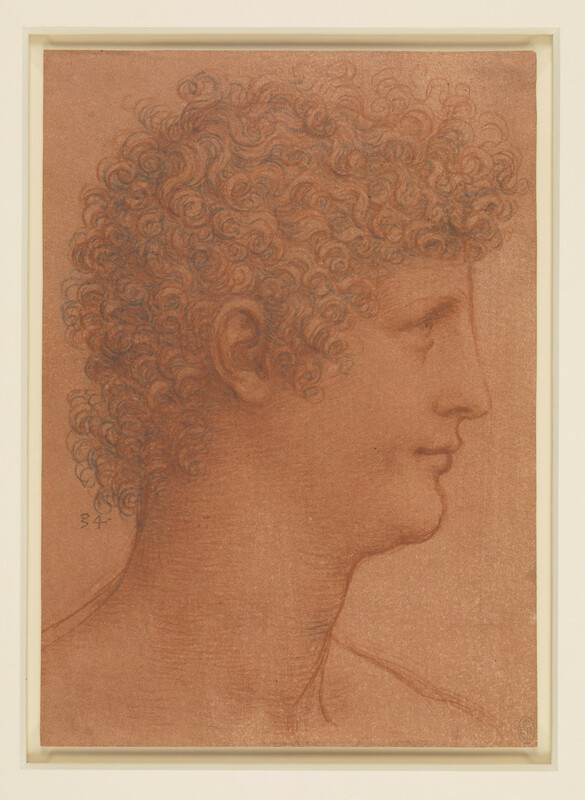 A drawing of the head of a young man turned in profile to the right. He has heavy classical features, and masses of curly hair. This is the most elaborately worked of all Leonardo's drawings of youthful heads, in a highly colouristic technique used by the artist for only a few years around 1510. The use of red chalk on red prepared paper limits the tonal contrasts of the face, whereas the black chalk of the hair overlays and mingles with the red in dense patterns of corkscrews. The long gently curving horizontal strokes of chalk build up a smoothly rounded surface suggestive of a layer of juvenile fat that has not been shed with the passing of adolescence; the barely defined jaw, merging with the slight pouch of a double chin, the suppressed smile, the straight nose and the untroubled eyes all testify to a life of idle luxury.